I’ve decided to finally truly tell my story about my adventures with Lyme disease. Why? Because I want the world to know that it is treatable, yes you can get rid of it and, most importantly, teach people how to prevent it in the first place. You and your family do not have to suffer for years on end as I have. Around eight years ago I found myself exhausted all of the time, my joints ached, my head was foggy, my feet burned, I felt depressed all the time, I had night sweats and all I wanted to do was sleep, especially behind the wheel driving. It was all I could do to go to work training my clients, pray that I made it home and crashed for the rest of the afternoon. It was no way to live. It wasn’t living at all, it was dying and it was certainly not a good time. I reached a point in my life that I was so sick and tired all the time to even continue my business as a personal trainer and wellness coach and so I had to do something. I scheduled a doctor’s visit who then tested me for thyroid issues and come to find out my thyroid was not functioning properly so he put me on the standard thyroid medications. After three more months of pain, fatigue, fogginess I went back to him and finally he did a blood test for Lyme. It came back positive. I want you to know that I was lucky! Why? Because only 30% of the standard blood tests come back positive. The rest of them, 70%, come back as a false negative as was the case for my husband. Lyme is a clinical diagnosis most of the time. In other words you need a Lyme disease expert to test you and treat you. The doctor treated me with antibiotics and if you know me, I hadn’t taken them for over 10 years! I hardly took pain medications let alone antibiotics! So, like a compliant patient, I took them for the 21-day course he prescribed. It was only after I did thorough research on Lyme disease did I realize there are so many co-infections that could come along with a tick bite. When I questioned the doctor as to what he was going to do about any possible co-infections, he said, “What co-infections?” He didn’t have a clue about Lyme disease. I continued my diligent research, when I wasn’t sleeping and went on a search for Lyme disease professionals to help me. After five years of searching and trying all sorts of antibiotics, herbs, supplements, and other nutritionals I finally found the combination of solutions that rid me of this wretched disease. Took nutritional supplements such as enzymes, probiotics, and multivitamins. Took many infrared saunas which helped to flush toxins from my body. Drank redox signaling molecules which helped to get rid of bad cells and protect the good ones. I’ll be posting more in the near future as to exactly what I did to help me finally feel amazing, energized, alive and vibrant! Wear a hat with your hair tightly fitted inside. Ticks love hair and they don’t wash out easy. Spray yourself from your head to your toes with Dr Mercola Bug Spray. It’s the best in my opinion as well as safe for you, your family and pets. Spray your yard with Ready-to-Spray Natural Flea and Tick Yard Spray which is what I’ll be spraying my yard with today. Lower the population of ticks in your yard with Tick Tubes . Hide them where your dogs can’t get to them as Nala (one of my dogs) found mine even though I thought I hid them well but apparently didn’t. Get rid of standing water in your yard as well as stay away from damp wood and leaves which are where they love to live. Trim trees with low-lying branches as ticks love to fall on you from them. Check yourself when you come in from an outdoors adventure and throw all your clothes immediately in the dryer for 20 minutes as the heat will kill them. 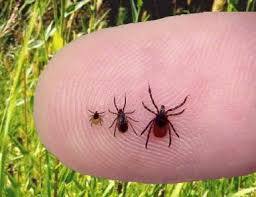 If you find a tick on you, pluck it gently as close to the skin as possible or use a Tick Key Tick Remover. You don’t want to leave the head inside nor do you want them to throw up inside of you which leaves you with more toxins! Lyme Disease is Serious Stuff Folks and I don’t take it lightly. I do mean to scare you enough to take precautions as it lives in your back yard. Nala came in yesterday with five ticks on her. I plucked them all off and put them in alcohol. Apparently flushing them down the toilet doesn’t work as they find their way back up somehow! So now I have a dedicated alcohol bottle for those nasty critters. Here are links to some articles that will explain in depth about Lyme disease and how to prevent it.